Should I go with blinds, plantations or rollers? Which windows specifically? The centre one and the one on right in photo? Plantations are beautiful, but require regular dusting. Roller blinds are easy and there are many choice ps as far as material and design. Plus, they can be motorised if you like. Are they to stand alone for your window coverings, or are you pairing them with drapes? All of them! Including slide door window. I have a massive slide door at the back of the house too that's 5m wide, so i would want to match everything up. Love your home Italian Girl. That roof structure is amazing. 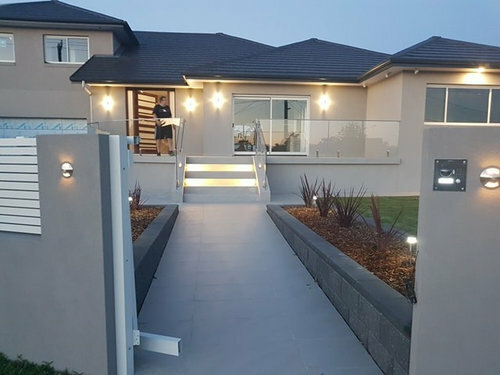 Lovely house. Plantation shutters can look nice, but they do cover a lot of window when you include the frame which goes around outside and center support. This put me off the shutters (apart from the dusting), so I opted for inset blinds with a moderate window tint for daytime privacy, which gives a streamlined modern look. Can you do some mock up internal pictures to see what you think? Best to choose what you love. Go for roller blinds and don’t get all block out only if you like for bedroom but all the ones could be light filtering so it’s not pitch dark when they are down and definitely get them motorised, one of the best features I have done. But if you are budget conscious you could get roller blinds from any company that has the fabric you like but motor can be retrofitted from cheaper place and if you have healthy budget get them motorised but hard wired so you don’t have to charge them and you will not have remote control just a switch on the wall. I agree oskuee. We had ours hard-wired - small square control on walls next to all windows & doors. Also have remotes so we can do adjustments from time to time, but rarely ever do that. Have blockouts on all bedrooms & theatre room, and light filtering on all others. I'm amazed how well the external blinds work at keeping heat and light out. Those are interesting blinds, Judith, do they look the same from outside? Do you recall who supplied them? Now knowing you are fitting out entire house, I'd suggest blinds. They look great, so many options, and I think someone would tire of all the dusting. For this style of exterior, I would add plantation blinds of the wide variety which are easy to clean. We installed these to the front and side windows that can be seen from the road, but the rest of the house only has sheers with heavy block-out curtains. The plantation blinds come in sections too, so if yo have a huge picture window, the blind can be sectioned into three or four. This gives you the choice of opening up one or all blinds, and will in the long term save your blinds from fraying. What exactly are two-sided blinds? Does that mean it's blockout facing outside but see-through looking outside from indoors? It's confusing trying to word it exactly, so will appreciate your explanation. Someone else has a similar Dilemna. Hi Annb1997 I was also confused and intrigued about the two sided binds - so looked them up and found they differ from double rollers. A company called 'Blinds on the Net' supply them. 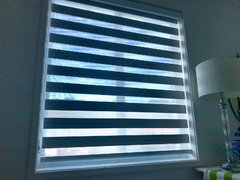 They are called Zebra Blinds and this extract from their website explains how the operate "The cleverly designed Zebra Blind utilses a horizontal striped fabric with alternating Translucent or Block Out and Sheer stripes. Two layers of this fabric move independantly to create overlaping combinations or Translucent and Sheer or Block Out and Sheer. A simple but effective idea that allows high levels of light and privacy control with the one product." thank you, dpsmum! I'm always amazed about all the clever ideas people have to come up with solutions. Cheers! 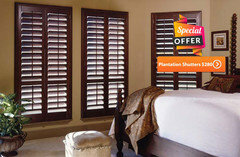 Plantation shutters are very beautiful l like it. Great article post I really happy with my home plantation shutters used in the home window very nice product. Roman blinds, timber shutters, roller blinds.... help! Roller Blinds - Configuration of panels/drops over large openings? Roller blinds or plantation shutters? ?